Meeting of the Academic Council of the Institute was held on September 18, 2018. Workshop "Quantum Information, Statistics, Probability" with a special session dedicated to Alexander Holevo’s 75th birthday was held on September 12–14, 2018, at the Steklov Mathematical Institute. International conference "Topology and Physics" dedicated to the 80th birthday of S P Novikov was held on 05–06 September 2018. Saint Petersburg beats Paris to win bid to host ICM 2022.
International Conference on Differential Equations and Dynamical Systems was held in Suzdal on July 6–11, 2018. The 6th Workshop on Combinatorics of Moduli Spaces, Cluster Algebras, and Topological Recursion was held in Moscow at Higher School of Economics, Steklov Mathematical Institute, and Skoltech on June 4–9, 2018.
International conference ''Algebra, algebraic geometry and number theory'' dedicated to the memory of academician Igor Rostislavovich Shafarevich will be held in Steklov Mathematical Institute on June 13–14, 2018.
International conference "Systems Analysis: Modeling and Control" in memory of Academician A.V. Kryazhimskiy was held in Steklov Mathematical Institute on May 31–June 1, 2018.
International conference "Algebraic Topology, Combinatorics, and Mathematical Physics" on occasion of Victor Buchstaber's 75th birthday was held in Steklov Mathematical Institute on May 24–30, 2018. Subsequent to the conference, International Seminar on Toric Topology and Homotopy Theory took place on May 30–June 1, 2018. Meeting of the Academic Council of the Institute was held on April 24, 2018. Meeting of the Institute's Scientific Staff was held on February 8, 2018. Meeting of the Academic Council of the Institute was held on Juanuary 25, 2018. Meeting of the Academic Council of the Institute was held on Juanuary 16, 2018. Meeting of the Academic Council of the Institute was held on November 30, 2017. Meeting of the Academic Council of the Institute was held on October 19, 2017. Meeting of the Academic Council of the Institute was held on October 10, 2017. The 8th International Conference on Differential and Functional Differential Equations was held in Moscow at RUDN University on August 13–20, 2017.
International Conference «Asymptotic Statistics of Stochastic Processes and Applications XI» was held in Peterhof, Saint Petersburg on July 17–21, 2017. The 39th Conference on Stochastic Processes and their Applications (SPA2017) was held in Moscow at Hotel Complex «Izmailovo» on July 24–28, 2017. Meeting of the Institute's Scientific Staff will be held on June 21, 2017.
International Conference «Mathematical Theory of Optimal Control» dedicated to the 90th birthday of Academician R. V. Gamkrelidze was held in the Steklov Institute on June 1–2, 2017. А.A.Karatsuba's 80th Birthday Conference in Number Theory and Applications was held in the Steklov Institute and Lomonosov Moscow State University on May 22–27, 2017. Meeting of the Academic Council of the Institute was held on April 6, 2017. The British-Russian seminar on toric topology and homotopy theory was held in Steklov Mathematical Institute on April 4 2017. The British-Russian seminar on toric topology and homotopy theory was held in Steklov Mathematical Institute on March 14–15, 2017. Meeting of the Institute's Scientific Staff was held on February 2, 2017. Meeting of the Academic Council of the Institute was held on January 24, 2017. Meeting of the Academic Council of the Institute was held on December 22, 2016. Meeting of the Academic Council of the Institute was held on November 29, 2016. Meeting of the Academic Council of the Institute was held on November 17, 2016. Meeting of the Academic Council of the Institute was held on September 29, 2016. Meeting of the Academic Council of the Institute was held on August 11, 2016. Meeting of the Academic Council of the Institute was held on May 19, 2016. October 2016 marks the 150th anniversary of Matematicheskii Sbornik journal. On January 19, 2016 Presidium of the Russian Academy of Sciences (RAS) awarder the honorary title "Professor of the Russian Academy of Sciences" to the mathematicians of Steklov Institute Aleksandr Bufetov, Aleksandr Gaifullin, Ivan Dynnikov, Dmitrii Kaledin, Sergei Kozyrev, Aleksandr Kuznetsov, Aleksandr Pechen, Maksim Shirokov, and Il'ya Shkredov. The title “Professor of the Russian Academy of Sciences” was set up in 2015. With this title the RAS expresses gratitude for the contribution to the development of science. The RAS elects the candidates for the title from scientists under the age of 50 who hold "Doctor of Sciences" degree obtained in Russia or a doctoral degree obtained in a foreign state, have significant scientific achievements and international recognition and are not members of the RAS. Professors of RAS have right to take part in various scientific councils and commissions of the Academy, be involved in solving scientific and administrative issues, problems of high technology development, as well as other issues related to their academic qualification. Resolution of Presidium of the Russian Academy of Sciences № 13 of January 19, 2016 (in Russian). Leading Scientific Researcher at the Department of Function Theory Bochkarev Sergei Viktorovich received A.A. Markov award of Russian Academy of Sciences for his works on «Trigonometic and orthogonal series». A.A. Markov award of Russian Academy of Sciences. Meeting of the Academic Council of the Institute was held on January 21, 2016. Meeting of the Academic Council of the Institute was held on December 24, 2015. The meeting of Executive Committee of EMS in Moscow, Moscow, November 27–29, 2015. Meeting of the Academic Council of the Institute was held on December 03, 2015. Meeting of the Academic Council of the Institute was held on November 12, 2015. Meeting of the Academic Council of the Institute was held on October 29, 2015. Meeting of the Academic Council of the Institute was held on October 8, 2015. Steklov Mathematical Institute of RAS and Mathematical Institute of the Serbian Academy of Sciences and Arts organize the International Conference «p-ADIC MATHEMATICAL PHYSICS AND ITS APPLICATIONS» in Belgrade, Serbia, from September 7 to September 12, 2015. Senior Researcher of the Steklov Mathematical Insitute (Department of Mathematical Physics) Anton Trushechkin as a member of the team «Saturn» won a competition in automatic machine learning on the Microsoft Machine Learning and Intelligence School (Saint-Petersburg, July 29 - 5 August, 2015). Academic Secretary and Leading Researcher of the Steklov Mathematical Institute Alexander Pechen attended the second annual Blavatnik Science Symposium in New York featuring the work of the Blavatnik Awards alumni and 2015 National Faculty Finalists (5-6 August, 2015). Meeting of the Academic Council of the Institute was held on August 27, 2015. Research fellow of the Steklov Mathematical Institute Mikhail Zhitlukhin was awarded with ORMI-OP&PM Prize (First degree) "for his insightful and deep contributions to the theory of probability and mathematical statistics". The new format of online publications of the Steklov Mathematical Institute includes the ability to select publications based on various criteria such as financial support. For example, one can select publications supported by the Russian Science Foundation project No 14-50-00005. Head of the Department of Probability Theory and Mathematical Statistics of Steklov Mathematical Institute Alexander Holevo has been honored with prestigious Claude E. Shannon Award of IEEE Information Theory Society. Meeting of the Academic Council of the Institute was held on June 25, 2015. On June 15, 2015, Alexander Izaak was appointed as First Deputy Director of the Institute. School and Workshop on Dynamical systems, Geometry and Control Theory will take place in Maksimikha village, Lake Baikal, the Buryatian Republic, from 6 to 17 July, 2015. The 10-th of April 2015 at the conference hall of the main academic building of Voronezh State University the ceremony of awarding the title "Honorary Doctor of VSU" to principal researcher of Steklov Mathematical Institute of RAS Professor V. M. Buchstaber was held. Congratulations! Out-Of-Staff member of Steklov Mathematical Institute Rostislav Grigorchuk received N.N. Bogoliubov award of the National Academy of Sciences of Ukraine. Leading Researcher of Steklov Mathematical Institute Alexander Bufetov received Sofia Kovalevskaya Award of the Russian Academy of Sciences for his works on ergodic theory. On February 5, 2015, Alexander Izaak was appointed as Deputy Director for Information and Publishing Activity of the Institute. Meeting of the Academic Council of the Institute was held on February 26, 2015. Leading Researcher of Steklov Mathematical Institute Alexander Gaifullin received Award of the Moscow Government for young scientists in mathematics, mechanics and informatics for his works on algebraic topology and combinatorial geometry. On 29 January, 2015, Session of Scientific Staff of the Steklov Mathematical Institute was held and a new Academic Council of the Institute was elected. Session followed by the first Meeting ot the new Academic Council. Valery Kozlov was elected as chairman of the Council. The Meeting also approved candidatures of Dmitri Treschev and Dmitri Orlov as Science Deputy Directors of the Institute and Alexander Pechen as Academic Secretary of the Institute. International Conference «Probability Theory and Its Applications» on commemoration of the 85-th birthdate of academician Yu. V. Prokhorov, organized by Steklov Mathematical Institute and Faculty of Computational Mathematics and Cybernetics of the Lomonosov Moscow State University, will take place in Moscow from 12 to 14 February, 2015. On December 27, 2014, First Deputy Director of Steklov Institute Armen Sergeev was elected as Foreign Member of the National Academy of Sciences of Armenia. International Conference «Days of Classical Mechanics» will be held in Steklov Mathematical Institute on 26 January, 2015. Mathematicians of Steklov Institute Sergei Ivanovich Adyan and Igor Rostislavovich Shafarevich became winners of the competition «Life dedicated to mathematics» organized by the Dmitry Zimin Dynasty Foundation and Independent Moscow University. Conference "Moscow Mathematical Society and Moscow State University" was held at MSU on December 23–25, 2014. The conference is dedicated to the 150th anniversary of Moscow Mathematical Society. The election of Director of the Institute was held on December 11, 2014. Valery Kozlov was elected as Director of the Institute. Meeting of the Academic Council of the Institute was held on December 2, 2014 at 16:00. Out-of-staff Member of Steklov Institute Rostislav Grigorchuk to receive 2015 AMS Steele Prize for Seminal Contribution to Research for his influential paper "Degrees of growth of finitely generated groups and the theory of invariant means", which appeared in Russian in 1984 in Izvestiya Akademii Nauk SSSR. Seriya Matematicheskaya and in English translation a year later. On November 12, 2014, first awards for scientific communications in Russia were presented on IV All-Russia contest for media innovations. Joint works of press services of institutes and media were distinguished in several nominations. In nomination "best TV / Radio broadcast" the award was given to press officer of Steklov Institute Alexander Pechen and presenter of radio station «Echo of Moscow» Yana Rozova for several interviews in the broadcast «Moscow. Territory of science» (broadcast is organized jointly with Department of Science, Industrial Policy and Entrepreneurship of Moscow). 30 October 2014: Stepan Kuznetsov, Applications of mathematical methods to natural language syntax (in Russian). 28 August 2014: Nikolay Andreev, Popularization of mathematics (in Russian). 29 May 2014: Аlexander Pechen, Some topics in dynamics and control of quantum systems (in Russian). Meeting of the Academic Council of the Institute was held on November 13, 2014. Meeting of the Academic Council of the Institute was held on November 6, 2014. Meeting of the Academic Council of the Institute was held on October 15, 2014. Meeting of the Academic Council of the Institute was held on October 2, 2014 at 13:30. On September 25, 2014, the Russian division for research and intellectual property of Thomson Reuters (Intellectual Property & Science, IP & Science) awarded Russian scientists, publications and scientific organizations which are the most influential according to Thomson Reuters. In the nomination «the Most influential Russian magazine» award was given to the Russian Mathematical Surveys – edition, which occupies the 18th place in the world among 299 journals in the subject area «mathematics». The magazine has managed to increase its impact factor compared with the previous year to 75% and now having reached a very high rating for mathematics – 1,357. Conference «Stochastics, Statistics and Financial Mathematics» will be held at Steklov Mathematical Institute of RAS on October 13–15, 2014. The conference is dedicated to the 80th anniversary of Professor Albert Shiryaev. An interdisciplinary forum Moscow Science Week (MSW 2014) is going in Moscow in the period 8-12 September, 2014. Forum takes together scientists working in physics, biology, life science, chemistry, material science, computer science, data science and humanities from Russia and abroad as well as engineers, programmers, representatives of research funds and public authorities. Vladimir Vatutin, Short Communication «Macroscopic and microscopic structures of the family tree for a critical decomposable branching process» in section «Probability and Statistics». Alexander Pechen was one of the four young (up to 40 years old) speakers at the Congress from Russian academic institutes. The Peoples' Friendship University of Russia with the cooperation of the Steklov Mathematical Institute of the Russian Academy of Sciences and the Lomonosov Moscow State University organize the Seventh International Conference on Differential and Functional Differential Equations, August 22–29, 2014. The Conference is a satellite of the International Congress of Mathematicians 2014, August 13–21, Seoul, Korea. Steklov Mathematical Institute and Samara State Technical University organize the Fourth International Conference «Mathematical Physics and Its Applications» in Samara, from 25 August until 1 September, 2014. Meeting of the Academic Council of the Institute was held on July 1, 2014 at 16:00. On June 10, 2014 Endre Szemeredi, Professor of computer science at Rutgers University and Abel Prize winner (2012) participated in seminar on «Problems of additive combinatorics and number theory» in Steklov Mathematical Institute. Steklov Mathematical Institute, Laboratoire Poncelet, and Higher School of Economics organized the 4th Workshop on Combinatorics of Moduli Spaces, Cluster Algebras, and Topological Recursion in the period May 26–31, 2014. On April 28, 2014, Steklov Mathematical Institute celebrates its 80th anniversary. Congratulations to all staff of the Institute! Letter of congratulations from Prime Minister of Russia Dmitry Medvedev (in Russian). Steklov Mathematical Institute celebrates its 80th anniversary. (in Russian). Leading scientific researcher of the Department of Complex Analysis Viktor Buslaev has received Mark Krein award of the National Academy of Sciences of Ukraine. Congratulations! The first Caucasian Mathematics Conference (CMC I) will be organized in Tbilisi, Georgia, on September 5 and 6, 2014. The conference will be organized under the auspices of the European Mathematical Society and the cooperation of the Armenian, Azerbaijan, Georgian, Iranian, Russian and Turkish Mathematical Societies. Plenary speaker from Russia will be corresponding member of Russian Academy of Sciences Dmitry Orlov. International Youth Conference «GEOMETRY & CONTROL» was held in Steklov Mathematical Institute on April 14-18, 2014. The conference was organized by the Steklov Mathematical Institute (RAS) and the Geometric Control Theory Laboratory of the Sobolev Institute of Mathematics (SB RAS) within the framework of the grant «Geometric Control Theory and Analysis on Metric Structures». The conference is devoted to problems arising in geometric control theory and to related problems in geometry and control. One-day conference dedicated to 50th anniversary of Yu. G. Prokhorov was held in Steklov Institute on April 4, 2014. Meeting of the Academic Council of the Institute was held on April 8, 2014 at 14:00. The Norwegian Academy of Science and Letters has awarded the Abel Prize for 2014 to Yakov G. Sinai of Princeton University, USA, and the Landau Institute for Theoretical Physics, Russian Academy of Sciences, "for his fundamental contributions to dynamical systems, ergodic theory, and mathematical physics". Congratulations! Spencer Bloch, R. M. Hutchins Distinguished Service Professor Emeritus in the Department of Mathematics of the University of Chicago, will read a minicourse "Periods in Algebraic Geometry" in Steklov Institute from April 1 to April 17, 2014. Meeting of the Academic Council of the Institute was held on February 27, 2014. Academic Secretary of the Institute Dr. Alexander Pechen received Award of the Moscow Government for young scientists in mathematics, mechanics and informatics for works on control of quantum systems. Congratulations! «The Conference dedicated to the Memory of Anatoly Alekseevich Karatsubа on Number Theory and Applications» was held in Moscow, in Steklov Mathematical Institute of the Russian Academy of Sciences on January 31, 2014. Meeting of the Academic Council of the Institute was held on January 23, 2014. Independent University of Moscow, Higher School of Economics and Steklov Mathematical Institute of Russian Academy of Sciences organized an international conference «Attractors, foliations and limit cycles» in honour of Yulij Ilyashenko's 70th birthday. The conference was held on 13–17 January, 2014 in Independent University of Moscow. Meeting of the Council of Young Scientists and Engineers of the Institute was held on January 13, 2014. Konstantin Shramov was awarded grant of Dmitry Zimin Dynasty Foundation for young mathematicians with candidate degree. Congratulations! Traditional winter session MIAN–POMI devoted to the topic "Harmonic Analysis and Theory of Functions" was held in Steklov Mathematical Institute on December 23–24, 2013. Meeting of the Academic Council of the Institute was held on December 27, 2013. Alexander Pechen was elected as Academic Secretary of the Institute. The State Duma adopted a law on the reform of the Russian Academy of Sciences. Steklov Mathematical Institute of the Russian Academy of Sciences together with the Faculty of Computational Mathematics and Cybernatics of Lomonosov Moscow State University organized on September 24–25, 2013 a special conference "Optimal Control and Applications" dedicated to the 105th anniversary of Lev Semenovich Pontryagin, an outstanding mathematician of the XXth century. Steklov Mathematical Institute of Russian Academy of Sciences and Association for Quantum Probability and Related Topics held 34th International conference on Quantum Probability and Related Topics on September 16–20, 2013. The draft law no. 305828-6 "On the Russian Academy of Sciences, the reorganization of the state academies of sciences and amendments to some legislative acts of the Russian Federation" passed in the second reading. International conference "Advanced Finance and Stochastics" was held at Steklov Mathematical Institute in Moscow, June 24–28, 2013.
International conference Algebraic Topology and Abelian Functions dedicated to the 70th anniversary of V. M. Buchstaber was held at Steklov Mathematical Institute in Moscow, June 18–22, 2013.
International conference dedicated to the 90th anniversary of academician I. R. Shafarevich was held at Steklov Mathematical Institute in Moscow, June 3–5, 2013. Russian Academy of Sciences (Steklov Mathematical Institute, Institute for Information Transmission Problems, Keldysh Institute of Applied Mathematics, Scientific Research Institute of System Development) together with Moscow Mathematical Society and Independent University of Moscow organize an International conference dedicated to the centenary of Israel Gelfand. The conference will be held on July 22–25, 2013 in Moscow. Seminar on Complex Analysis: Report of Stanislav Smirnov "Quasiconformal maps and harmonic measure" will be held at Steklov Mathematical Institute in Moscow, March 4, 2013 (conference hall). Bureau of the Department of Mathematical Sciences, Russian Academy of Sciences approved the new editorial board of the jounal «Matematicheskii Sbornik», February 19, 2013.
International conference "Contemporary Problems of Mathematics, Mechanics, and Mathematical Physics" dedicated to the 150th anniversary of the outstanding scientist, mathematician, and science organizer Vladimir Andreevich Steklov was held at Steklov Mathematical Institute in Moscow, May 13–14, 2013 and at St. Petersburg Department of V. A. Steklov Institute of Mathematics in St. Petersburg, May 16–17, 2013. One-day conference "Novikov Day" dedicated to the 75th anniversary of Sergey P. Novikov will be held at Steklov Mathematical Institute in Moscow, June 17, 2013.
International conference "Contemporary Problems of Mechanics" dedicated to the 80th anniversary of academician A. G. Kulikovskii was held at Steklov Mathematical Institute in Moscow, March 18–19, 2013. Bielefeld University and Steklov Mathematical Institute of RAS organize the Workshop "p-Adic Methods for Modelling of Complex Systems". The Workshop will take place in Bielefeld, April 15–19, 2013 (ZiF Bielefeld University, Bielefeld, Germany). Academician Valery Kozlov was elected a foreign member of the Serbian Academy of Sciences and Arts (Belgrade, November 1, 2012). Congratulations! Traditional winter workshop MIAN–POMI was held December 19–21, 2012 in St. Petersburg Department of Steklov Mathematical Institute. The topic of the workshop "Quantum and Classical Inverse Scattering Methods". The Second Annual Memorial Conference dedicated to the memory of V. A. Iskovskikh was held at Steklov Mathematical Institute, December 27, 2012. Annual memorial conference dedicated to the memory of Andrei Nikolaevich Tyurin (24.02.1940–27.10.2002) "Algebraic and Differential Geometry of Andrei Tyurin"
October 24–26, 2012, Conference Hall, Steklov Mathematical Institute of RAS. International Conference "KUL!FEST" dedicated to the 60th anniversary of Viktor Stepanovich Kulikov will be held at Steklov Mathematical Institute in Moscow, December 3–7, 2012.
International Conference "Chinese-Russian conference on Number Theory" was held in Steklov Mathematical Institute, October 8–12, 2012.
International Conference "Analysis and Singularities" dedicated to the 75th anniversary of Vladimir Igorevich Arnold was held at Steklov Mathematical Institute in Moscow, December 17–21, 2012. Second Internet video conference "Day of Mathematics and Mechanics" will be held in Steklov Mathematical Institute, September 17, 2012. Conference hall, 9th floor, 10:00 (MSK). International Conference "Stochastic Optimization and Optimal Stopping" was held at Steklov Mathematical Institute, September 24–28, 2012. The organizers: Steklov Mathmatical Institute, PreMoLab MIPT and STRADO IITP. International Workshop "Relation of String Theory to Gauge Theories and Moduli Problems of Branes" was held in the Steklov Mathematical Institute, September 10–14, 2012. Siberian Federal University, Steklov Mathematical Institute of RAS, and Institute of Mathematics, NAS of Armenia organize the International conference "Fourth Russian-Armenian workshop on mathematical physics, complex analysis and related topics". The Conference will take place in Krasnoyarsk, September 9–16, 2012 (Siberian Federal University). Steklov Mathematical Institute of the Russian Academy of Sciences, Samara State Technical University, and Samara State University organize the Third International Conference on Mathematical Physics and Its Applications. The Conference will take place in Samara, one of the most beautiful places in Russia on the Volga River, from August 27 to September 1, 2012.
International Conference "Arithmetic as Geometry: Parshin Fest" was held in Steklov Mathematical Institute, November 26–29, 2012. Steklov Mathematical Institute of RAS, Vladimir State University and Lomonosov Moscow State University are organizing The International Conference on Differential Equations and Dynamical Systems. The Conference will be held in the city of Suzdal from June'29 to July'4, 2012. Steklov Mathematical Institute, Independent University of Moscow, and Higher School of Economics organized 28 May–2 June 2012 the 3rd International Workshop on Combinatorics of Moduli Spaces, Cluster Algebras, Knots, and Topological Recursion. Alexander D. Izaak was appointed to the position of Academic Secretary of the Steklov Mathematical Institute of the RAS from 2 April, 2012, retaining the position of Head of the Department of Computer Networks and Information Technology. Sergei P. Konovalov was transferred to the position of Senior Scientific Researcher of the Laboratory of Popularization and Promotion of Mathematics. International conference "Birational and affine geometry" took place in the Steklov Mathematical Institute of RAS, Moscow, April 23–27, 2012. Conference "Differential Equations and Optimal Control" (Moscow, Steklov Mathematical Institute, April 16–17, 2012), dedicated to the 90th anniversary of Academician Evgenii Frolovich Mishchenko. On 20 March, 2012 Department of Algebraic Geometry of the Steklov Mathematical Institute of the RAS was formed. Dmitri O. Orlov was appointed to the position of Head of the Department. Scholar Seminar "Interaction of Mathematics and Physics: New Perspectives" (Moscow, August 22–30, 2012). Traditional winter session MIAN–POMI devoted to the topic "Probability and Functional Analysis", was held in Moscow, February 16–17, 2012. The Russian-German conference on Several Complex Variables was held in Steklov Mathematical Institute, February 27 – March 2, 2012.
International workshop "Logical Models of Reasoning and Computation – LMRC12" will take place at Steklov Mathematical Institute in Moscow, Russia, from 1.02.2012 to 3.02.2012.
International Workshop on Complex Analysis and its Applications was held in Steklov Mathematical Institute, December 26–27, 2011. 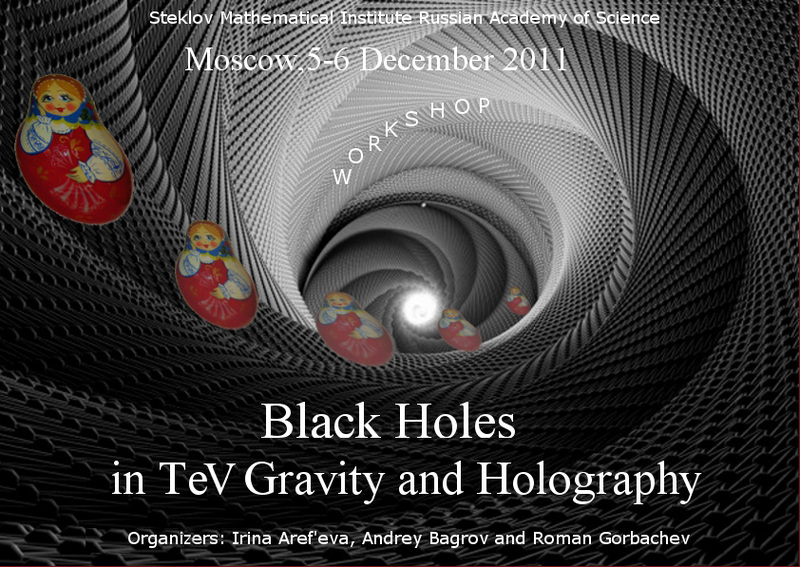 Steklov Mathematical Institute of the Russian Academy of Sciences organized the Workshop Black Holes in TeV Gravity and Holography (December 5–6, 2011). Steklov Mathematical Institute of the Russian Academy of Sciences organized the International Conference Irreversibility Problem in Classical and Quantum Dynamical Systems (December 8–10, 2011). 25 October 2011, 12:45, Conference Hall, Steklov Institute, RAS. Steklov Mathematical Institute of the Russian Academy of Sciences with Laboratory of Algebraic Geometry of Higher School of Economics organized the Conference Geometric structures on complex manifolds (October 3–7, 2011). Third International Conference "Geometry, Dynamics, Integrable Systems" – GDIS 2011, Lisbon-Sintra, Portugal, 10–16 September 2011. Steklov Mathematical Institute of the Russian Academy of Sciences with Laboratory of Algebraic Geometry of Higher School of Economics are organizing Conference in honour of Fedor Bogomolov's 65th birthday (September 1–4, 2011) and Workshop "Derived Categories in Algebraic Geometry" (September 5–9, 2011). The Steklov Mathematical Institute of the Russian Academy of Sciences, with the cooperation of the Peoples' Friendship University of Russia and the Lomonosov Moscow State University, organized the Sixth International Conference on Differential and Functional Differential Equations, August 14–21, 2011. In the framework of the conference, the International Workshop "Spatio-temporal dynamical systems", August 18–20, 2011, took place. Albert N. Shiryaev receives the 2011 Abraham Wald Prize in Sequential Analysis. The Abraham Wald Prize in Sequential Analysis awards the best publication in the journal Sequential Analysis: Design Methods & Applications (SQA). Steklov Mathematical Institute congratulates professor Albert N. Shiryaev. Steklov Mathematical Institute jointly with Academy of Criptography of Russian Federation have founded a new journal "Matematicheskie Voprosy Kriptografii" [Mathematical Aspects of Cryptography]. The journal posted on the portal Math-Net.Ru. Access to the articles of 2010 is free. The workshop "Instantons in complex geometry" was held on March 14–18, 2011, at Steklov Mathematical Institute in Moscow. The opening ceremony of the International Conference on Applied Mathematics and Computer Science dedicated to Academician A. A. Dorodnicyn’s 100-th Birthday Anniversary was held in Steklov Mathematical Institute, December 4, 2010.
International Conference "Geometry and Integrable Systems " was held in Steklov Mathematical Institute on December 27–30, 2010.
International Symposium "Visions in Stochastics" was held in Steklov Mathematical Institute (Department of Probability) during November 1–3, 2010, with participation of representatives from UK, Germany, Russia, Finland, France, Tunis, Ukraine. The program provides 50-minutes plenary talks, 20-minutes contributed talks and poster presentations. The Third Russian-Armenian workshop on mathematical physics, complex analysis and related topics was held in Tsaghkadzor, Armenia at 4–8 October 2010. The workshop was organized by Steklov Mathematical Institute Institute of Mathematics of the National Academy of Sciences of Armenia Yerevan State University Russian-Armenian (Slavic) University. International conference "Stochastic Optimal Stopping" (SOS-2010) will be held on September 12-16, 2010, Petrozavodsk, Russia. The conference "Mathematics – XXI century PDMI 70th anniversary" was held on September 13–18, 2010, at St. Petersburg Department of V. A. Steklov Institute of Mathematics. Russian-French Laboratory Poncelet, MIAN, and the Higher School of Economics organize on May 24–28, 2010 the 2nd Workshop on Combinatorics of Moduli Spaces, Cluster Algebras and Symplectic Invariants. Steklov Mathematical Institute and Moscow State University organize the Conference GEOMETRY, TOPOLOGY, ALGEBRA, and APPLICATIONS dedicated to the 120th anniversary of Boris Delone (1890–1980). It took place at Steklov Mathematical Institute (Moscow) on August 16–20, 2010.
International Conference «Approximation Theory» dedicated to the 90-th anniversary of the birth of Sergey Borisovich Stechkin (1920–1995) was held on August 23–26, 2010, at Steklov Mathematical Institute in Moscow. The International Conference ALGEBRAIC GEOMETRY: Methods, Relations, and Applications dedicated the 70-th anniversary of A. N. Tyurin was held on February 24–26, 2010 in Steklov Mathematical Institute of RAS, Moscow, Russia. Starting from 2010 Steklov Mathematical Institute is the Associated member of the International Association of Mathematical Physics (IAMP). Details on IAMP can be found on the site http://www.iamp.org. The eighth International сonference "Advances in Modal Logic" (AiML 2010) was held on August 24–27, 2010, at Steklov Mathematical Institute of RAS in Moscow. Second International Conference "Geometry, Dynamics, Integrable Systems - GDIS 2010", Belgrade, 7–12 September 2010. The International Conference on Differential Equations and Dynamical Systems was held in the city of Suzdal, Russia, from July'2 to July'7, 2010. The International Conference TOPOLOGY, GEOMETRY, AND DYNAMICS: ROKHLIN MEMORIAL dedicated the 90-th anniversary of the birthday of Vladimir Rokhlin (1919–1984) will take place on January 11–16, 2010 in Euler International Mathematical Institute, St. Petersburg. The International Conference Gauge Fields. Yesterday, Today, Tomorrow dedicated the 70-th anniversary of A. A. Slavnov took place on January 19–24, 2010 in Steklov Mathematical Institute of RAS, Moscow, Russia. Russian-Japan Symposium on STOCHASTIC ANALYSIS OF THE ADVANCED STATISTICAL MODELS took place at Steklov Mathematical Institute (September 15, 16, 17, 2009). International conference "Geometry of Algebraic Varieties" dedicated to the memory of Vasily Alexeevich Iskovskikh was held in Steklov Mathematical Institute, June 29–July 3, 2009.
International Conference on Mathematical Control Theory and Mechanics was held in town Suzdal from July 3 till July 7, 2009. The Second International Conference on String Field Theory and Related Aspects took place on April 12–19, 2009 in Steklov Mathematical Institute of RAS, Moscow, Russia. Congratulations to Academician Evgenii Mishchenko. Evgenii Mishchenko has been awarded the Demidoff Prize for outstanding contributions to the Mathematical Control Theory and the Theory of Oscillations. In 2009 Steklov Mathematical Institute celebrates its 75th anniversary. Annual Memorial Conference dedicated to the memory of A. N. Tyurin will take place at Steklov Mathematical Institute, October 28, 2008. The Second Russian-Armenian workshop on mathematical physics, complex analysis and adjacent problems was held in Steklov Mathematical Institute, October 5–11, 2008. Session was broadcast on the website of Steklov Mathematical Institute. The one-day conference "Group theory and complexity" took place on 17th of July 2008 at Steklov Mathematical Institute. The list of invited speakers include: A. Belov, A. Bufetov, A. Vershik, R. Grigorchuk, B. Kashin, R. Mikhailov, A. Razborov and others. International workshop "Combinatorics of moduli spaces, Hurwitz numbers, and cluster algebras" took place at the Poncelet Russian-French Mathematical Laboratory (IMU) and at the Steklov Mathematical Institute on June 2–7, 2008. One-day conference "Novikov Day" dedicated to the 70th anniversary of academician Sergey P. Novikov will take place at Steklov Mathematical Institute in Moscow, June 3, 2008. Morning session was broadcast on the website of Steklov Mathematical Institute. International conference "Logical models of reasoning and computation" will take place at Steklov Mathematical Institute in Moscow, Russia, from 5.05.2008 to 8.05.2008. Mathematical Institute SANU (Belgrade) together with the Steklov Mathematical Institute of RAS have organized an international conference "Geometry. Dynamics. Integrable Systems". The conference was held in Belgrade, September 2–7, 2008.
International Conference on Differential Equations and Dynamical Systems was held in town Suzdal from June 27 till July 2, 2008. The Fifth International Conference on Differential and Functional Differential Equations DFDE-2008 was held in Moscow, August 17–24, 2008. In commemoration of the 100th Anniversary of the birthday of L. S. Pontryagin the International Conference "Differential Equations and Topology" was held in Moscow, June 17–22, 2008.
International Conference Analysis and Singularities dedicated to the 70th anniversary of Vladimir Igorevich Arnold was held at Steklov Mathematical Institute in Moscow, August 20–24, 2007.
International Conference on Mathematical Control Theory and Mechanics was held in town Suzdal, June 22–June 27, 2007. The Third International Conference on p-Adic Mathematical Physics: From Planck scale physics to complex systems to biology "p-ADIC MATHPHYS.2007" took place at Steklov Mathematical Institute in Moscow, October 1–6, 2007. Russian-Japan Workshop Complex Stochastic Models: Asymptotics and Applications will take place at Steklov Mathematical Institute in Moscow, June 4–5, 2007.
International School-Conference "Geometry and Quantization" dedicated to the memory of A. N. Tyurin took place at Steklov Mathematical Institute in Moscow, September 9–23, 2007.
International Conference on Mathematical Control Theory and Mechanics will be held in town Suzdal from June 22 till June 27, 2007. Moscow State University and Steklov Mathematical Institute organize the International Conference "Diophantine and analytic problems in number theory" dedicated to the 100th birthday of a prominent mathematician Alexander Osipovich Gelfond (MSU, Moscow, January 29–February 2, 2007).